Properties in Largs North average 4.6 out of 5 stars. Property 12: Westbury Cottage B&B clean neat great location! Great location, everything you could need for a comfortable stay! Thank you for a great stay! 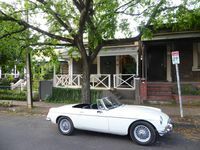 The cottage is in a great spot, only minutes from the city, North Adelaide and Norwood. Everything you could need is provided, including extra towels, lots of breakfast provisions and bath robes. Being able to have our little dog stay with us as well was a huge bonus! Would love to stay again.